What is National Cupcake Day™? National Cupcake Day™ is a coordinated Canadian event to support local shelters, SPCAs, and Humane Societies. In 2018, over $700,000 was raised for injured, abused and abandoned animals across the country. How does National Cupcake Day™ work? For National Cupcake Day™ you host your own mini event in support of animals. Register online and download everything you need to make your event a success. If you make a self pledge of $25 or more we send you a special Host Kit in the mail. 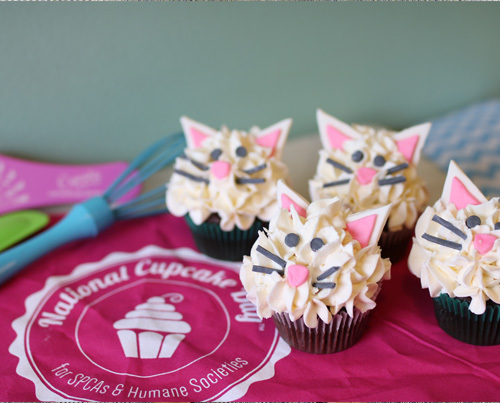 All you need to do is plan your National Cupcake Day™, encourage everyone you know to donate in support of animals, and supply the cupcakes for your Cupcake Day party for everyone to enjoy! Please note, host kits will not be mailed past February 20, 2019. All Cupcake Day parties are run by animal-lovers like you and are held at workplaces, homes, schools and community centers across the country. Businesses in particular are a delicious place to hold a Cupcake Day party! When is National Cupcake Day™? National Cupcake Day™ is officially Monday, February 25, 2019 but you can hold your Cupcake Day party on any day in December, January or February that works for you. You could even hold them over multiple days! How can I support my local SPCA, Humane Society or shelter? When you register for National Cupcake Day™, you will have the opportunity to choose any one of our participating Societies to receive all of your proceeds. If your local shelter is not listed, please have them contact us to see if we may be able to include them next year. This is the sixth year of this Canadian event, and it is growing. Please help us raise money for animals across Canada even if your local shelter may not be listed. Your money will go directly towards rescue efforts for animals in dire need. Do I have to bake cupcakes to support National Cupcake Day™? The main way people choose to support this event is by hosting a National Cupcake Day™ party and inviting guests to make a donation in exchange for a delicious cupcake. But this is not the only way to support the event. Think about all your friends and family who live out of town. Would they donate to receive a virtual cupcake for a cause that is important to you? Or, simply raise money through donations, or donate yourself! Not a fan of cupcakes? No problem! Bake cookies, cakepops, pupcakes (can't forget about the dogs) or a healthy alternative! Imagine fruit served in little muffin tin liners.. too cute! The possibilities are endless! This event can be as creative as you want it to be! Host cupcake competitions, come up with amazing new recipes, or do whatever you can think of to help the animals! Check out our Social Media pages inlucidng Pinterest for party and baking ideas! What should the suggested donation amount be? It’s a good idea to start by setting an ambitious fundraising goal, then divide that number by either a suggested donation amount (to figure out how many cupcakes to bake) or by the number of cupcakes you want to bake (to figure out the suggested donation amount of each). During the registration process, you will be asked to enter your fundraising goal and you can change it at any time in your Personal Fundraising Centre. Show your friends and family that you are committed to the cause by making the first donation to your cupcake campaign! What is a Cupcake Day Host Kit? Within 10 business days of registration and a self-donation of $25 or more, you will be mailed your official Cupcake Day Host Kit. You only receive a mailed host kit if you have made a self donation of $25 or more. Inside you’ll find your fundraising guide, donation box, a poster, cupcake selfie frame, a SURPRISE and other stuff you’ll need to host a successful event. You can download some of these things online right now if you just can’t wait to get sifting and mixing. Please note, host kits will not be mailed to anyone who registers after February 20, 2019. What is a Personal Fundraising Centre? Your Personal Fundraising Centre is your fundraising online headquarters and contains all the tools you need to connect with potential National Cupcake Day™ party guests, receive donations, track your progress, and build anticipation for your National Cupcake Day™ party. Send emails (we even have email templates for you to use! ), post on Social Media outlets including Instagram, Facebook, Snapchat and Twitter. Personalize your page with stories, pictures, and videos. The secret ingredient to your success as part of National Cupcake Day™ is asking your hungry Cupcake Day party guests to make a donation. This will give you a better idea of exactly how many cupcakes to bake and you won’t need to worry about collecting donations at your party! Your Personal Fundraising Page is totally safe, secure and it’s the most convenient for everyone! Can I fundraise on a team? Yes, the more the merrier! When you register, choose the "Batch of Cupcakeaeers" option. When you do so, you will create both a National Cupcake Day™ Team Personal Fundraising Page, as well as an Individual Personal Fundraising Page. You can use the Team Personal Fundraising Page to track team fundraising and to ask other team members to join you. Can I hold a National Cupcake Day™ Party at my workplace? Yes! In fact workplaces are some of the best places for National Cupcake Day™ parties. Create the best coffee break ever, host friendly baking or fundraising competitions between departments or floors or offer cupcakes to your customers in exchange for a donation. The ideas are endless! How do I submit funds that I raise? All the details on submitting your funds can be found on the How to Submit Your Funds page . What is the minimum age requirement? Can my kids fundraise? Yes, we welcome "Mini Cupcakeateers" (under 18 years of age) to participate in National Cupcake Day™ with the approval and help of a parent or guardian. When your youth registers, they will need to electronically sign a waiver indicating they have your permission to participate in the event. Have a question that hasn’t been answered here? Feel free to contact our National Cupcake Day™ Headquarters at info@nationalcupcakeday.ca, 1.888.668.7722 ext 378. We are here for you by phone Monday to Friday 9:00am to 5:00pm EDT. If you call outside of business hours, simply leave a voicemail and we will get back to you as soon as possible!